It’s hard to believe that the world’s first combination candy bar is still an unknown name for most. I am referring to the GooGoo Cluster, which was made by the Standard Candy Company back in 1912. Like most classic and retro candy, they can be difficult to find unless you live in the region that is producing them. So in this case, anyone who isn’t living in the South is very possibly missing out on a very tasty piece of history. What made the GooGoo Cluster so new in 1912 was, unlike Hershey’s and all the other large candy companies at the time, the GooGoo Cluster wanted to be more than just a solid bar of chocolate. 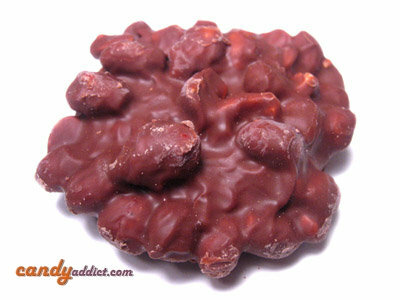 Instead, the creators of the GooGoo made a mound of marshmallow, caramel and roasted peanuts covered in milk chocolate. Now that’s a candy with ambition! How the GooGoo got it’s name is shrouded in myth, since no one exactly remembers who was first to suggest it. As the years have passed, the recipe for the GooGoo has remained unchanged due to Standard Candy Company’s strong ties to tradition. Even so, new varieties of the GooGoo have been added; the GooGoo Supreme with pecans instead of peanuts and the GooGoo Peanut Butter which replaced the marshmallow and caramel. Ready to find out how they taste? 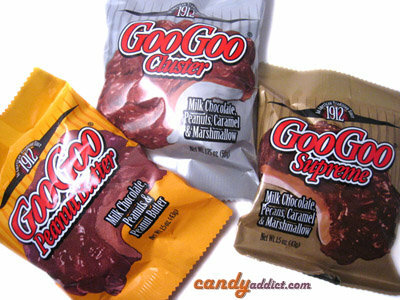 GooGoo Cluster: “Milk Chocolate, Peanuts, Caramel and Marshmallow” reads the description on the silver package. I like how they have the number 1912 displayed on the top, reminding you that this fella has a lot of history behind him! Turning the GooGoo over, the ingredients list is fairly straightforward although I notice both chocolate and mockolate are mentioned. This is disappointing since I’d think they’d try and preserve the integrity of this classic candy bar, even though they claim the recipe hasn’t changed. The “mockolate” was added as the initial coating as it cools faster than the real chocolate over-coat. This thin coating keeps the nut meats from falling off when the hot chocolate over-coat is applied! I believe this ingredient was added when the process became automated instead of hand made! Once unwrapped, I have a hard time calling the GooGoo a “bar” because it’s really a plop. The peanuts are right on top and stick out in all directions, making this look like an alien or something you find in a cow pasture. The smell is dominated by the aroma of the salty peanuts; I don’t even get a whiff of the chocolate. My first bite was full of peanuts and chocolate. The nuts are nice, they’re not as salty as the smell would lead you to believe, but they have a good raw nutty flavor. The peanuts also have the skins on them still, which I thought was an original touch. Once I got to the caramel and marshmallow, I was struck by how chewy they were, which I enjoyed. It gave the bar a nice satisfying substantial feel. The caramel is good too, with nice creamy dairy notes and a good burnt sugar flavor. One thing about the GooGoo did surprise me though: I tasted coconut in there. Yes, coconut. I flipped the wrapper over again to find that coconut was indeed mentioned, pretty far down the list, but it was there. It’s a nice addition and heightens the marshmallow flavor, but I’m confused as to why they left it off the description on the front. Perhaps they feel that it’s an inferior flavor element in the grand scheme of GooGoo. GooGoo Supreme (Milk Chocolate, Caramel, Marshmallow and Pecans): Comes in a gold wrapper. The ingredients are the same as the GooGoo Cluster: real chocolate and whole milk, although further down “chocolate coating”, the mockolate, is listed with all its nasty trans fats. The Supreme is much prettier to look at than the GooGoo Cluster. The pieces of the pecans are chopped, so the surface texture is not as lumpy as it is with the peanuts, but has more of a nice gravelly appearance. It smells nice and chocolatey like the others, but I don’t detect any nuttiness from the pecans. My first couple of bites lacked the marshmallow, but was full of the chocolate, pecans and caramel. It’s quite chewy too! The caramel is lovely, with great milky burnt sugar flavors and a good texture. The chocolate is pretty standard, it’s more sweet then chocolatey, but that’s to be expected in these sort of combined bars. Once I did reach the marshmallow, I hardly noticed it except for the vanilla taste it delivered. I got nothing in terms of the texture department. The pecans are nice and were a good size too; not too big as to get stuck in my teeth and not so small that I didn’t notice them at all. A good twist on the regular GooGoo Cluster. GooGoo Peanut Butter (Milk Chocolate, Peanut Butter and Peanuts): This is the only GooGoo missing the marshmallow and caramel center. All the rest of the elements are the same, heck, it even looks the same as the Cluster. What gives this one away immediately is the powerful smell of peanut butter. Nutty, salty and robust. The peanuts are the same as the GooGoo Cluster, nice and raw tasting with the skins still on. It took me a couple of bites before I hit the peanut butter center and yum! It’s good! It reminds me of the Reese’s Peanut Butter: dry, a little crumbly, a nice full peanut flavor with a salty kick. Overall, the three ingredients work really well together in their simplicity: the milk chocolate adding sweetness, the “bulk” coming from the peanut butter center and the peanuts adding a nice crunchy texture. I also gave this one a try frozen, since I’ve read online that these are wonderful eaten that way. One thing I noticed right away was how nice the chocolate and the peanut butter felt frozen; it has an obvious cooling effect that makes the peanut butter and the milk chocolate’s flavor more intense. The texture becomes drier, making it very crumbly and a little more difficult to consume. Now matter how you eat it, the GooGoo Peanut Butter is a permanent member of the family for a very, very good reason. These things are great! All 3 of them. I especially liked the peanut Butter ones. YUM! My guess is that “GooGoo” comes from the word “goober” (peanut). GooGoo Clusters are tasty, but only when they’re fresh! I’m glad you got to try the whole line. Always like these retro candy reviews—thanks! I am shocked to learn that the US does not know of this tasty treat. Here in North Carolina, we can buy Goo Goo multi-packs that come 8 to a box (i think) for less than $3 in Walmart, or in most gas stations. I wish they would come out with a dark chocolate version! I’m in NC and this is the first time I have tried them. I have heard of them, just never tried them. this website is making me hungry!!!!!!!!! I’ve long enjoyed the GooGoo Supreme and I am often pleased to find 4-packs at my local Dollar Store. What a GREAT treat and what an amazing price! I used to get these in PA at the Dollar General store. They were the only place that carried them in our area. They are so sweet that they hurt my teeth, but I don’t care. Everytime I see them, I buy as many as they have! i’d like to try the peanut butter ones . I have never heard of those, they look amazing! Tonight, as I was devouring a bowl of rocky road ice cream, I thought of Goo Goo Cluster ice cream. I am a child of the 80′s and remember how much my dad and I both liked it although I remember it having a vanilla ice cream base instead of chocolate. Anyhow, I discovered a bit of history on the Goo. So there you have it…the unofficial history of the slogan and name of the Goo Goo Cluster. Damn it…now I REALLY want one! I of course love the original Goo Goo Clusters but I have never tried the supreme or the peanut butter ones but I will as soon as I find them. The store locator said that Kroger has the original ones (I knew that Dollar General has them) so maybe they have the other ones as well. Anyway Goo Goo Clusters are delicious.